Mark your calendars with this month's top local events you won't want to miss. Joe Jefferson Players • 11 S Carlen St.
7:30 p.m. Fri. – Sat., 2 p.m. Sun. Grandson of the infamous Victor Frankenstein, Frederick Frankenstein inherits his family’s estate in Transylvania. With the help of a hunchbacked sidekick, Igor, and a leggy lab assistant, Inga, Frederick finds himself in the mad scientist shoes of his ancestors. Tickets: $10 – $20. History Museum of Mobile • 111 S Royal St.
9 a.m. – 5 p.m. Mon. – Sat., 1 p.m. – 5 p.m. Sun. Explore the unique traditions associated with Mobile’s Carnival celebration and discover the origins of the city’s mystic societies. This one-of-a-kind exhibit features the regalia of early Carnival monarchs, iconic costumes from area mystic societies, original float designs and more. Let the good times roll! Click here to view the complete 2019 parade schedule. 7:30 p.m. Sat., 2:30 p.m. Sun. Mobile Symphony Orchestra presents music from beloved movie scores. Tickets: $20 – $80. The Pillars • 1757 Government St.
6:30 p.m. – 9 p.m. Celebrate Valentine’s Day at this casino-themed event complete with blackjack, craps and roulette. Guests will enjoy food, complimentary beer and wine, live music and some great prizes! Each guest will receive $1,000 in “fun money” to use at the gaming tables. At the end of the night, guests will cash out with the dealer and receive a ticket for every $500 they have won. Those tickets will be exchanged for chances at some very nice prizes. Individual tickets are $60, couples tickets are $100. Proceeds benefit the Pediatric Congenital Heart Center at Children’s of Alabama. Azalea Manor • 751 Dauphin St.
11 a.m. – 2 p.m. Help decide who has the best king cake in town! 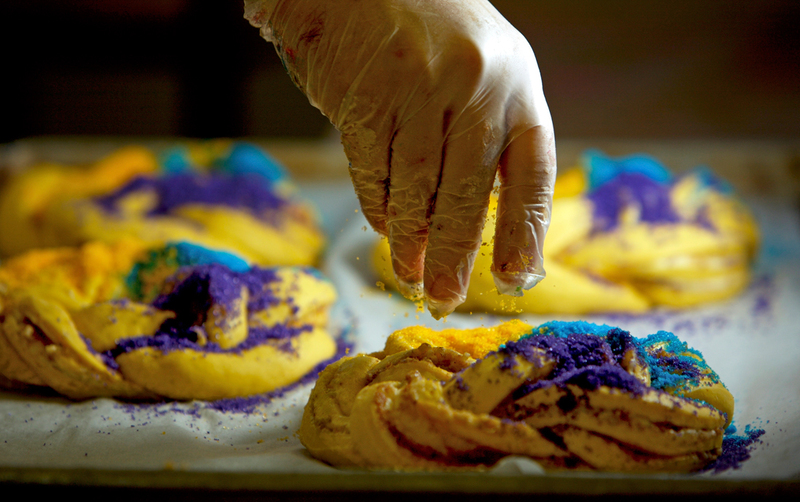 Get your taste buds ready for a day of traditional and non-traditional King Cake tastings, specialty cocktails and food truck grub. Tickets are $15 in advance and $20 at the door. Children 12 and under are free. A portion of the proceeds will benefit the Fuse Project. Oak Hollow Farm • 14210 South Greeno Rd., Fairhope. 11:30 a.m. – 2 p.m. The annual fundraiser features live music from Blind Dog Mike and the Howlers, inflatables for the kids, a hay ride, a variety of homemade desserts for sale and of course, a chance to sample some of Baldwin County’s best chili. Admission for adults is $12.50 in advance or $15 at the gate. Children 12 and under are free. All proceeds benefit the Ecumenical Ministries of Baldwin County, an agency dedicated to providing aid for low income families, the disabled and elderly. Murphy High School • 100 S Carlen St.
8 p.m. Enjoy Wolf-Ferrari’s opera about an innocent secret that becomes blown out of proportion by suspicion and jealousy − a reprise of the first opera produced by Mobile Opera 72 years ago! Tickets: $35 – $40. 10 a.m. – 4 p.m. The festival features a full day of delicious food, 130 artists from throughout the South and music for the whole family on two stages. In addition, there will be a large Kids’ Zone with activities, a huge car show and a “Paws on Parade,” so make plans to bring your furry friend in costume! Admission is free. 3 p.m. Let the good times roll with your four-legged friend in this walking Mardi Gras parade for the canine population. This year’s parade theme is “Hairy Pawter and the Sorcerer’s Bone.” All proceeds from MMOR will benefit The Haven, Fairhope’s no-kill animal shelter.